I’ve collected quite a few squash recipes over the years. This one is my new favorite. The soup is easy to make and only requires a few key ingredients that you are likely to have at home. 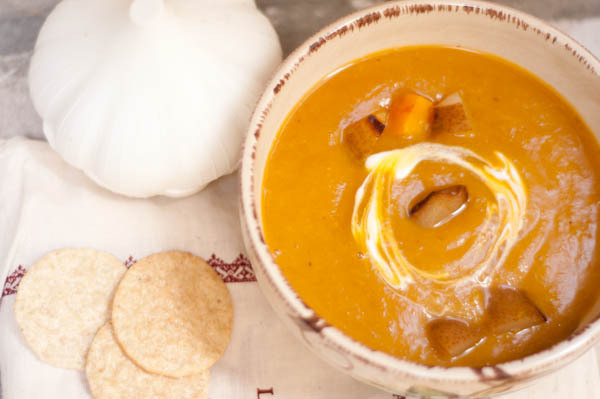 Sweet and zesty, it satisfies my fall comfort food cravings. As an added bonus, the soup is low in salt and high in antioxidants. Try it out and let me know what you think. Preheat the oven to 425F. Cut the squash in half, scrape out the seeds and save them. Cut each half into thirds. Put squash (without the seeds) in a large baking dish or roasting pan with the pears and all but a few slices of the ginger. Brush oil, season with salt, and bake until fragrant and tender, about 1 hour. Turn the pieces once or twice so that they have a chance to caramelize on more than than one surface. If the squash seems very dry (some varieties are), add 1 cup water to the pan to create steam and cover with foil. When the squash is tender, transfer everything from the pan to a cutting board, add 1 cup of water to the pan, and scrape to dissolve the juices, reserving the liquid. Scrape the flesh of the squash away from the skins. You should have about 2 cups. To make stalk, bring 6 cups water to a boil and add seeds and eventually the skins, the remaining ginger, and 1/2 teaspoon salt. Lower the heat and simmer, covered, for 20-30 minutes. Meanwhile, melt the butter in a soup pot. Add the onion, give it a stir, and cook over medium-low heat, stirring frequently, until it begins to brown a bit and is flagrant, about 10 minutes. Add the ginger, pears, and squash then deglazing water. Strain the stock into the pot. Bring to a boil, then lower the heat and simmer, covered, for 25 minutes. Cool briefly, then puree until smooth and pass through a food mill or a strainer to ensure a silky texture. Serve as is or a swirl in the sour cream. For presentation, dice a pear or an apple, sprinkle with a little sugar, and caramelize in a little butter or oil. 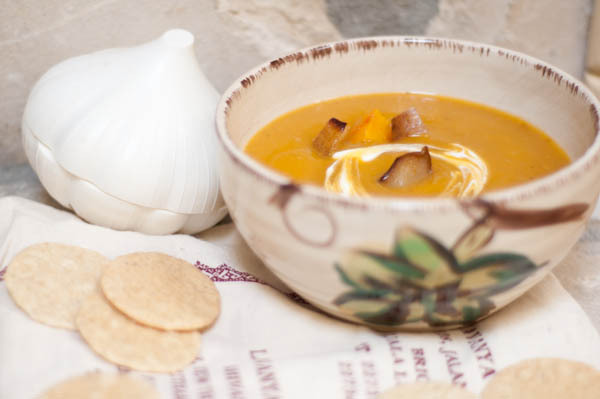 Medium-bodied Naked Winery Complicated Viognier wine is aromatic and fruity, complimenting very well with this wonderful fall soup. This sounds really good… i am sure Simona will love it. She loves all orange soups :) Will try next week! Ilona, ginger makes this soup is a little spicy. I know that you favor more mild foods; therefore, reduce the amount of ginger. I can’t wait to try them out. 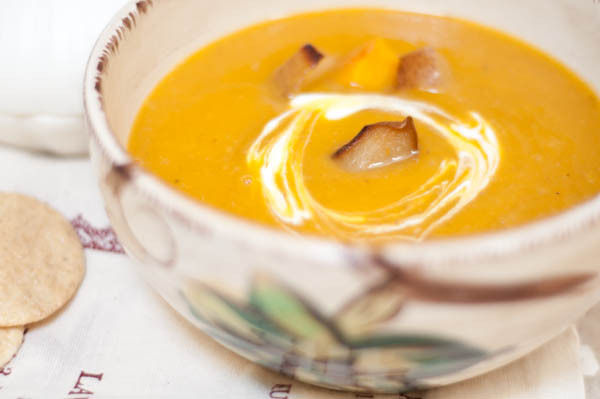 I love Butternut squash….and just by looking at your photos, make me hungry already. Great soup for kids too…Thanks for posting!! Anny, I hope you like it! Awesome post, it’s been a long-time since I’ve been on here. I see that nobody has lost their passion. Good to be back. It’s such a great site. cool, extraordinarily interesting!!! I have been back here 3 times now and am absolutely loving the energy on this discussion. Thanks for a wonderful outlet to read high quality details.